Conostylis candicans is an evergreen clumping perennial that will reach around .3m with a slightly larger spread. 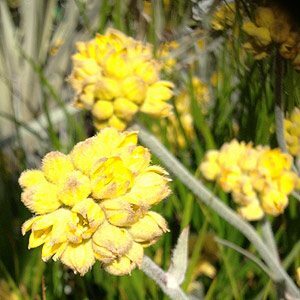 Attractive blue grey foliage with yellow flowers appearing in spring this a drought tolerant plant that is useful for roadside plantings, or as a border plant. Sometimes referred to as the grey cotton head. Widely available for sale from mail order and retail nurseries, Conostylis candicans are closely related to Kangaroo Paws. They are a strap leafed plant that prefer a sunny position and a well drained soil. C. candicans or Grey cottonheads are one of the more popular species. Conostylis candicans silver sunrise flower (picture right) is one of a number of named cultivars. Not that fussy about soil except for good drainage, Conostylis candicans grows well in full sun and works well in the rock garden. Humidity can cause fungal diseases. Best in a sandy type soil. or try hilling up the soil to improve drainage and plant on the raised area. Flowers – Yellow balls on tall stems. Foliage – Mid green, tufted in habit. Frost tolerant – Mild frosts. Drought tolerant – Medium, but may not flower in extremely dry conditions.